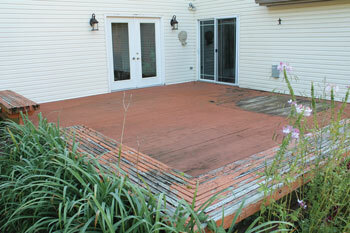 Does Your Dated Deck Need Some TLC? As the first rays of springtime sun begin to peep through April’s clouds, warming the air and teasing us with the promise of even pleasanter weather to come, we turn our mind’s eye toward the approaching days when we can again enjoy our home’s outdoor environs: veggies and flowers in a garden, kids or grandkids splashing in a pool, and time to relax with our bare feet up, wiggling our toes in the sunshine on a backyard deck. It’s faded. It’s cracked and peeling. It’s rife with splinters, and you’re not even sure it’s level anymore. It’s hard to underestimate the damage the elements—not to mention years of foot traffic—can do to a traditional, wooden deck. 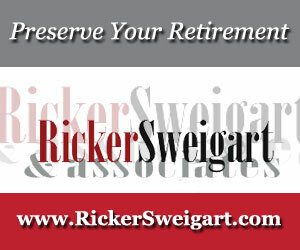 Such was the predicament of Christianne Rupp, vice president and managing editor of On-Line Publishers, and her husband, Randy. The Rupps’ approximately 20-by-22-foot wooden deck, originally built in the late ’80s, received a damaging, fading blast of full sunlight during the day. 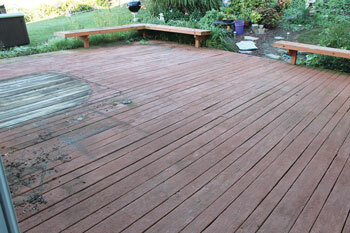 Several years back, the Rupps attempted to preserve their deck by applying a painted-on product that claimed it would form a tough coating over the existing wood, akin to having had the deck resurfaced. 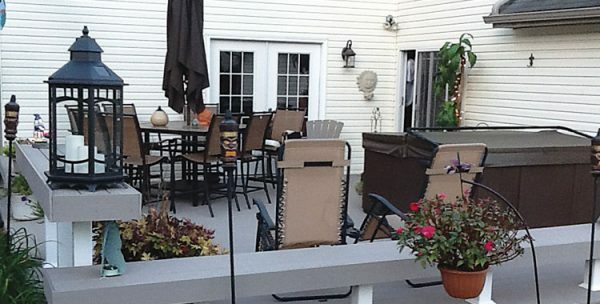 Determined to finally give their outdoor living space the thorough overhaul it needed and deserved, the Rupps researched products and decided to have the deck torn down and rebuilt using AZEK, a capped polymer decking material that comes in a variety of colors and real-wood looks. “We decided to go with the composite material (AZEK), which had a higher cost but had a great look with no maintenance,” Randy Rupp said. AZEK comes with a 30-year warranty and promises to withstand the elements and resist scratches, stains, mildew, and mold. After receiving quotes from a few construction companies, the Rupps went with Lititz-based Knob Hill Construction. Knob Hill specializes in framing houses and townhomes but also frames decks, renovates and remodels homes, and performs many “smaller” jobs. Despite the “pumpkin” color and splintering planks, Darren Hoover, co-owner of Knob Hill Construction, could still see the original deck’s foundation was something he could work with. Because the Rupps ran the boards in the same direction and square on the joists, Hoover was able to frame the new joists at 16 inches on center. He said the Rupps had considered running the boards diagonally, but that would have meant framing the new joists 12 inches on center and would have also resulted in a lot of wasted boards from cutting each board longer as they moved away from the house. 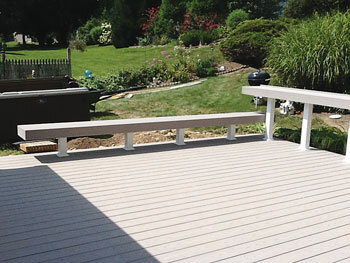 As anyone who’s ever done a home-improvement or remodeling project knows, choices abound—in this instance, even down to how you want your deck boards fastened: by using hidden fasteners or by face-screwing the boards. Hoover and the Rupps went with the latter, using a color-matched screw that blended in with the deck boards and can’t easily be seen. 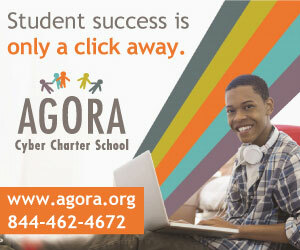 It also makes it easier to replace a board if necessary. The hot tub nestled near the side of the house called for some extra consideration. 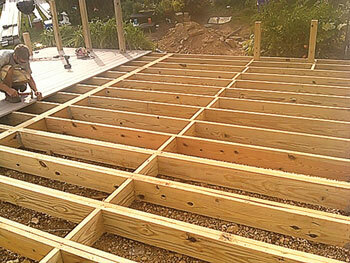 That section of the deck needed to be able to carry the hot tub’s extra weight, so Hoover installed extra six-by-sixes and doubled up the joists supporting the hot tub to ensure the hot tub would sit on a strong, even surface and not sag even after years have passed. Having transformed the deck from “pumpkin orange” to a more modern and muted gray, Hoover recommended accenting the four-by-fours supporting the built-in bench seats with white, vinyl sleeves. Hoover and his crew also added a bar for entertaining and replaced an existing French door with an Amish-made French door with a composite jam and brickmolding, which will never rot. The aged, sliding patio door got a similar upgrade, too. 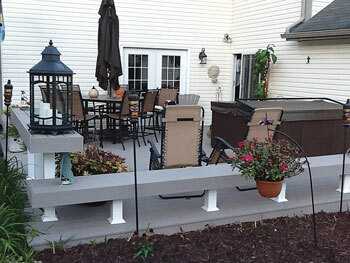 “The raised bar area (formerly part of the surrounding bench) adds a classy touch while being able to accommodate additional seating with stools,” Randy Rupp said. Hoover was pleased with the way the project progressed, despite meeting some resistance from the sometimes unpredictable Central Pennsylvania soil. With the renovation completed with plenty of time to spare before summer sets in, the Rupps are more than pleased with the results and eagerly await the pitter-patter of their grandsons’ splinter-free feet.